Semiotics is the study of meaning-making – the process of how people interpret and make sense of life events, relationships, and the self. Biosemiotics is the combination of the scientific fields of semiotics and biology and studies the prelinguistic meaning-making, or production and interpretation of signs and codes in the biological realm. Almost everything except how we came to be can, to some degree, be explained through science. But what Terrence Deacon, a Neuroanthropologist and professor at the University of California, Berkely, argues is that there’s more to reality that needs to be explained – like the production and interpretation of signs and codes in the biological realm. How life went from nothing to living, breathing consciousness. And this is where Biosemiotics steps in, to build answers to these neglected questions. In an interview with Tom Palmer of Sane Society, Terrence Deacon explains a theory, or blueprint, for how nature can create order through chaos. The theory is that order is the process of creating absence – whittling down parts until they serve just one simple function. That simple function then influences the function of other parts around it, leading to a whole new function created by the sum of those parts. It is a theory that suggests that every function leads to a greater function, and that us ‘being’ may just be part of an even greater function. 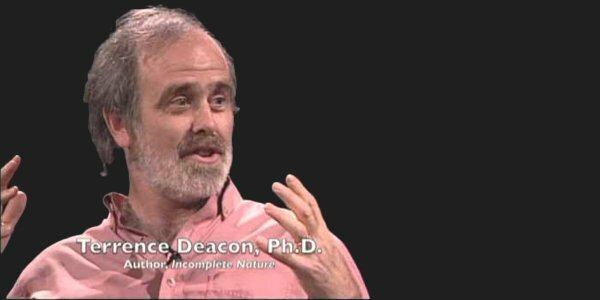 Terrence Deacon’s research can be found in book form – Incomplete Nature, How Mind Emerged from Matter. “The key is to figure out that our experiences and values come out of the world. They’re not something separate that can’t be figured into known physics. We need a bigger ‘physics’, so to speak” — Terrence Deacon.
? A British Mother Who Saved Her Son’s Life By Secretly Treating Him With Cannabis Is Now Campaigning For Its Legalisation Video Reveals Why Tesla Believed The Numbers 3, 6 & 9 Are Secrets To Our Universe ?